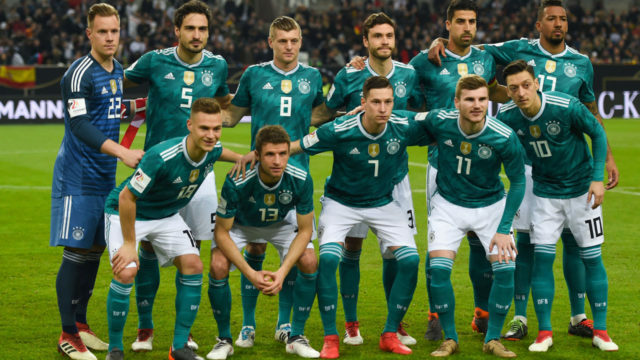 With the 2018 World Cup looming, defending champions Germany sit atop the FIFA world standings despite three draws and a defeat in their last four games. Germany drew 0-0 with England at Wembley, 2-2 with seventh placed France in Cologne, 1-1 with eighth-placed Spain in Duesseldorf and were beaten by second-placed Brazil in Berlin two weeks ago. When Joachim Loew’s youthful outfit, including just two players from the 2014 final starting line-up, lost to Brazil it ended a 22-match unbeaten run dating back to the Euro 2016 semi-final defeat to France. The Brazilians have consolidated second with their win against Germany as well as an easy 3-0 victory over World Cup hosts Russia, both of which they achieved without injured star Neymar. Belgium climb two places to third with their multi-talented line-up, which includes Kevin De Bruyne and Eden Hazard, after friendly international wins over Saudi Arabia and Japan. Alexis Sanchez’ Chile climbed one place to ninth and are the only nation in the top ten who failed to qualify for Russia 2018.